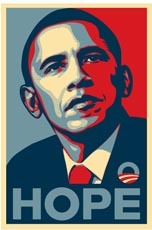 Barack Obama is the hope that so many of us have been waiting for. A hope for a better government; a hope for better poitics; a hope for a better world. Let’s work together to get Senator Obama elected and to become the Greatest President ever!!! It is very clever. I think hope is missing in our society with gas prices rising, real estate sky rocketing, the stock market tanking, our sons in a war that few claim and want, and many American’s suffering from Bush fatigue… yes, we are looking for hope. The problem is that hope is not found in a campaign or clever slogan. It is not found in a Messianic figure like Obama or a war hero like McCain. True hope must transcend who we are, be bigger and more grand. It must inspire us to press on in life with joy, even when the material world is falling apart. Yes, we all seeking hope… for a fail-safe future. But there are no guarentees in life. It doesn’t matter who we vote for, who wins the election, or what the state the economy is in… nothing is fail-safe. We must hang our lives on the knowledge of God’s constant love and goodness and the unfailing promises of the Bible. So if you are looking for a hope that is fail-safe, then hang out in the Gospel of John for a couple of weeks. See if it doesn’t pour steel into your soul to rejoice in the tough times. See if the God’s breath of hope doesn’t freshen your outlook.